Just as medical doctors have an assortment of approaches for diagnosing and quantifying the differing ailments and health risks of patients, educators need comprehensive assessment tools to document the vital signs to help every child reach his or her full potential. School leadership also needs more accurate information to help teachers reach their fullest potential. 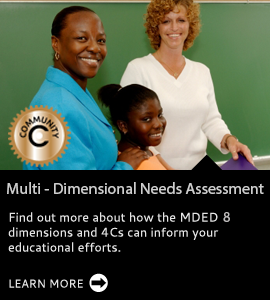 Our Multi-Dimensional Needs Assessment provides valuable evidence essential for diagnosing what changes are needed to improve educational achievement and educator effectiveness. We do this by focusing on eight dimensions of education that have been linked to highly effective schools through more than 40 years of research. Multi-Dimensional Education (MDED) offers a comprehensive menu of professional development tools and resources. We offer a wide array of evidence-driven workshops, keynotes, book study talks, data-driven educator online courses and onsite consulting. Our website also provides access to free training videos and an assortment of tools to help you gather the multi-dimensional data essential to your success. But the goal of MDed is to provide you with Solutions and not just Statistics! To strategically approach professional development, we believe you must first identify your strengths and challenges before you begin any type of organizational systemic improvement plan. With so few funds and resources available in today’s economy, grants provide an excellent opportunity to test promising new practices and programs. Assessing these valuable grants with sound measures and methods is essential to meeting the evaluation requirements of the grants and gathering evidence needed for securing future grants. Multi-Dimensional Education Inc. has a successful track record providing grant evaluation services for studies funded through private, state and federal monies. Our nationally respected evaluation services, methods and measures provide you with the undisputable evidence and non-biased outside evaluation services you need!